We are out of town. We’re warm. We’re coming home very soon, but that’s why I’ve been uncharacteristically silent. How Americana is that photo? I don’t enjoy accounting paperwork. That sounds funny from someone who once worked in a finance department! Anyway… that is to say that I am very happy to have finished doing my tax paperwork for 2008. That was the reason I’ve been a little less visible here on the blog. In reward, I invited a friend over for soup and chocolate cake. Jen Sygit came over and we just did tea and soup, a simple few hours of chatting and a meal. I love it when we can get together, it seems to not happen often enough. Her voice is as strong and expressive as ever, her songwriting is stronger every day, and her musicianship (and that of her band) is top notch. Great stuff. I literally play it over and over when I need company in the house and I’m alone. Photo today is Jen with Drew Howard behind her, at the RicStar Music Therapy Camp benefit. The date was around August 2007. I taught my computer class again tonight… I teach a group of fourteen (mostly) retirees how to use the computer on Monday nights. Basic stuff for smart people who never had training. It is very rewarding for all of us. They wait in line sometimes to thank me and say goodbye until the next week. I am very lucky for this one day a week that harkens back to my six years as a computer trainer and 2-3 years as a Y2K consultant/Access programmer. I have almost a week off from teaching, and the taxes are done. What shall I knit? Input welcome, as always. I made samples of my Buttons and Beads Bowl pattern, for a few more shops recently. Folks who are knitting these are loving them. One student, Leslie, says she has made a dozen already. She says she will send photos. My red/magenta/white/chocolate bowl is made with Kaleidoscope. It is on display at Threadbear Fiberarts in Lansing. The purple bowl is made with Malabrigo Merino Worsted. It is on display at Yarn Garden in Charlotte, Michigan. These photos are before and after embellishing, though both photos are after felting. The Threadbear bowl has vintage shell buttons on it, and the Yarn Garden bowl has hand-blown glass beads in all sorts of sizes and variations on the color purple. The original photo I showed you of this design was more subdued (rather than energetic). The teal and turquoise bowls in that photo (3rd image), are on display at Rae’s Yarn Boutique right now, along with a bowl made of Noro Kureyon. The purple one with beads I got to keep! I had a lot of fun knitting these. They take just a little bit of knitting time, a negligible amount of yarn, and are great for gifting (or for holding your own button collection). I’m still knitting a sample sock for my First-Time Toe-Up Sock pattern, out of my Blueberry Resonance Flammegarn sockyarn. I’m enjoying this, I know what to do and the rhythm of just making stitches is very calming. I’m done with the foot and heel, and working on the leg. No new photos since I showed you this one, unfortunately. Saturday was supposed to bring a big dump of snow on Lansing, Michigan. It turned out to be merely some snow, where everything is covered, but nothing that would make it difficult to drive (for those who drive on snow often). I lucked out, in any case. My class canceled and I did not have to shovel my car out on any deadline (Brian usually does the shoveling but he’s suffering a cold right now, so I will no doubt shovel today). Snow does have a sound-muffling feature, which is a nice thing in a city neighborhood. I am alone at home today/Saturday doing administrative work. The sounds I hear are the furnace blowing, my keyboard clicking as I type, and an occasional car passing by. When I get bored of silence, I’ll play Jen Sygit’s new CD, then go back to quiet for a while longer. I don’t mind working at my computer, especially when I have no appointments interrupt the flow. I love being alone during the day. I could not do it for days on end, but it’s a nice relief from being in charge of classes, sometimes. 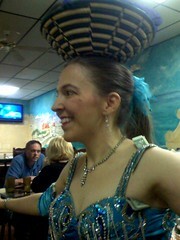 Friday ended with my dance event at New Aladdin’s Restaurant, which was a great way to finish. Friend April and daughter Isabel came. April got some photos of Isabel and I dancing together, which are not processed for web yet. I’ll bring you photos of the Friday dance event when this paper deadline I’m working on is handled. Meanwhile, you can see this photo of Isabel, holding the heart I knit her for Valentine’s day. The heart is knit from Aspen yarn (super fat, Ravelry calls it Bulky but I find it thicker than other yarns marked with that label). I knit it pretty tightly and then did not felt it before sewing and stuffing it. The pattern I used is again the Anna Hrachovec free Heart pattern, a big favorite of mine (and of the kids I teach to knit). This is the same yarn I knit Isabel’s “hug” from about a year ago. She loves her hug (it’s like a blanket which can be wrapped around shoulders and back, hug-like). Now she has a valentine heart hug, too. And with that… back to paperwork. Shows are at 6:30 and 8pm, I’m dancing with Phaedra. Dancing lasts about a half hour. No cover, and really good Lebanese food, at a reasonable price! When my life is going like a drudge, if I remember myself, I find a kid who loves me. It turns out this week is turning into kid week. This is good. Monday, I did not see the 3rd graders I often knit with, because they had a holiday off. However, I took a 13 yr old to dinner. Good stuff. Wednesday I had tea with Isabel and then I saw little Beatrice later in the evening. Many toddler hugs. All good. Wednesday afternoon, for my work, I had three knitting kids. The best! Thursday I usually go to lunch with Altu. This week I go to lunch with Altu and some kids we love. More good. I think my week is turning around. Already. Some times, it feels like life is a toboggan going down a hill so fast that everything is a blur. Sometimes it seems I’m sitting backwards in the toboggan. Sometimes I’m stuck in mud. Right now I seem to be in the backward mode. I ripped out thousands of stitches (will share that with you sometime) on one project. I started another project, knit for a week, then got stopped short and I need to figure out what to do next. I was working on taxes on my VISTA computer (used to do Quicken on my XP computer) and it thought I was not authorized to save, so it didn’t save the work I did. Now I have set the program to “start as administrator” and I have to approve it to start up before it will work, but now it’s saving the work I’ve done. Bah, humbug. And I have had a car repair to do, that I believed could reasonably be solved with my good brain, a good manual, and a set of drivers/wrenches which fit my car. I’ve done a number of screwdriver-friendly repairs in my driving history, and this seemed do-able. However, a week and a half into it, I give up. I’m going to find someone who does this every day and pay them to do it. That’s what money is for. My car is 11 years old and looks great, it’s worth it, but I’m bummed I was not able to do this one myself. But right now the sun has decided to peek through the clouds for a few seconds. I will declare that a good sign. (First photo above looks like most of the sky today… right photo is sunshine with a little blue sky peeking out.) If it doesn’t mean anything besides a short bout of sun’s rays, that is enough for me. Back to writing class handouts and doing taxes. I do get lunch with Altu, which will be great, and I have several students at Rae’s tonight, also good. My friend Cynthia is an all-around creative soul. We both knit, we both do music in some way, we both love color. Cynthia had enough of the white colorless winter landscape a handful of weeks ago. She did something about it! She went to the store, bought balloons, put some water in them for weight, blew them up, and put them in her flower pots near her porch. They lasted a good long time, which sounds really cool to me! Here is a photo of her winter garden, and a photo of friends Bonnie and Cynthia knitting together at a concert (I think at Cappucino Cafe), a few months back. 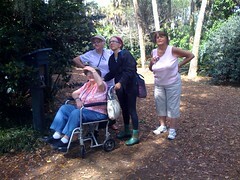 My Brian took the photo of the knitters, Cynthia took the garden shot, and all know I’m sharing the photos here with you. Tuesday/tomorrow, Mid-Michigan Knitters Guild will have their monthly meeting, from 7-9pm. The location is the Haslett Schools Administration building. Haslett is just east of East Lansing. The meeting place is essentially a few blocks behind the Meridian Mall. It is just off Marsh Road, turn east at the light by the Middle School, park at the middle school (unless you need handicapper parking, etc.) and cross the street to the lovely new building. For those who know the library, you would just zigzag past Meridian High School/Community Ed Building and turn left and youâ€™d see the library. Click the Admin. Building link and see a Google map. The address is 5593 Franklin Street (very near Nemoke Trail). Our meeting room is downstairs. Itâ€™s a new building, Iâ€™m sure there is an elevator though I did not use it myself last time. This is a guild for anyone who enjoys working with yarn or fiber. You can knit, you can crochet, you can weave, make felt, spinâ€¦ you can wish you knew how to do any of those things but not know how yet. All ages, cultural backgrounds, men and women are welcome. No fee to walk in the doorâ€¦ though we who return each month do pay a small fee for dues to help the group continue. We would love to see new faces. Just walk in and say â€œhi, Iâ€™m new, my name isâ€¦.â€ and you will be welcomed. Please, if you are in Lansing and havenâ€™t come yet, consider it this Tuesday. Last Wednesday I was teaching my “Knitting Rocks” kidz’ knitting program at Rae’s. My newest young knitter, K (I met her at a Jen Sygit concert, we were both knitting in public), realized not long before her mom was going to come and get her, that she needed to have Valentines for her parents. There was no way I could teach her how to knit a heart in that amount of time. My mind raced, and came up with an idea. We have some sweaters in the storage boxes for the kidz, that I shrunk several times in the washing machine. They can use these for anything they want. Often, my knitters would rather knit than cut and sew, so we access the sweaters infrequently. I figured maybe we could cut hearts out of a felted/shrunk sweater, if we had any colors that seemed suitable. I thought maybe we had a burgundy sweater. So I descended the stairs in Rae’s store, and went to the three boxes which store the kidz’ supplies. And we found better things than I had remembered! There was a small part of a red sweater remaining, and a burgundy sweater that was partly already cut up, some neutral sweaters, and most of a lavender/purple sweater with embroidered flowers. I could see immediately that the lavender sweater would fit the newest knitter. It had been cut down the middle front already by another child, and the sleeves were cut off at a good short-sleeved length. The fronts were chopped up from someone making a pair of mittens once, but the top section was whole. I put it on the child and she liked it. We took it off her shoulders and I cut the bottom as straight as I could, and then we decided to round off the corners of the front like a bolero or shrug. She LOVED it. I think she looks adorable, don’t you agree? Oh… and after the fun shrug adventure? We cut out red felt hearts. Those turned out great for her Valentine project. Everything turned out even better than we could have imagined. Isn’t it nice when things work out so well? I love neon signs. I took a photo of this as the sun went down, from across the street, last week Saturday. I never get tired of signs like this. Lovely, yes? You know I love clothing. I love embellishment. I love handmade things of all sorts. I love history. I love things from all over the world, and I wear clothing from many corners in my every day life. I spent 38 days in eastern Africa four years ago. My friend Altu, who was raised in Ethiopia, took me home. We spent over 3 weeks in Ethiopia, and one week each in Kenya and Egypt. It changed my life, and we have been even closer friends since that trip. The last two days I was in Ethiopia, I determined to buy as much handmade work as possible with the Ethiopian funds I had left in my wallet. Africa needed my money more than I did, and the lovely things I could get with it were amazing in value at the time (prices for this sort of thing have more than tripled in 4 years, even with only a 10% loss in exchange rate). Ethiopia is justifiably proud of their cotton fabrics, and I bought as many as I could. They have dense, fluffy blankets made with four layers of handspun, handwoven cotton, and I bought a few of those. I also got clothing, a few shirts with hand embroidery as decoration and a dress for me which was hand woven and hand embroidered. Lovely pieces. I have worn them here since I returned. But there were a handful of dresses hanging from the ceiling, which were the most amazing quality — I knew I could not afford them. The outer fabric was hand-spun, hand-woven soft cotton gauze, so thin that the dress needed to be lined for modesty. The bottom hems were woven with synthetic colored bands, which weighted and decorated the skirt (they use synthetic so that the dyes will not run in the wash). And then, there was embroidery all the way up the front of the dress, from hem to neckline, in the colors of the woven hem band. I was sure these dresses would cost the equivalent of many weeks’ wages. I did not even ask about them when I was buying things. At the end of our transaction, they put my purchases in two large grocery-bag sized bags for me, and they brought us tea. This is not uncommon, we were brought tea in a shop in Egypt as well, after a large purchase was finalized. Loved it. But clearly the tea signaled the end of the transaction. And then I had the guts to ask how much the dresses cost. And they were so affordable, it was insulting to the handworkers who made them. I could have planned ahead and purchased a couple of them. But by the time I knew that, I had spent every last paper bill I had exchanged. I could not buy anything more. For four years I pined over “the dress that got away.” And then a few weeks ago, when Altu returned from Ethiopia, she brought me this one. Handspun cotton. Hand woven. Bottom hem is a deep woven colored band. there is a similar band on the wrap (called a netele). The front and cuffs are 100% hand-embroidered. The turquoise threads are metallic, the others are shiny but not glittery. Altu knew this was the dress for me. She checked out several dresses to make sure the length was right. Her mother liked a different one. She knows that I am just plain a sucker for anything turquoise. This one, for the record, is nicer than the ones I remember seeing four years ago. This dress is just plain amazing. It makes me want to embroider again. Yes, I gave Altu some money (in case she could find one for me) when she left. I would have loved anything handmade. But a shiny turquoise embroidered dress? Oh, my! This is a dream come true. I will be wearing this dress to sing for Valentine’s Day at Altu’s restaurant, tomorrow night. I will feel like the most beautiful woman in Lansing. So far, so good. The yarn is very pleasant, and I do not usually get to knit my own yarns. It’s a treat. Actually, the yarn fluffs up a bit when washed. I knit a bit further than the picture shows, then I dunked it into some water. It seemed to stretch out like crazy, but it dried overnight and in the morning it was just plain perfect. No stretching, just puffy full stitches ready to stretch if need be. I’m happy to put my name on this product. The colorway was named after me by a friend. I am soooo into turquoise. This tank is really a sample so I donâ€™t know when/if Iâ€™ll wear it, but Iâ€™m still thrilled to knit with my own yarn and cast on for a project Iâ€™ve long wanted to try. I went to the pet store and got 25 pounds of tiny gravel to fill in the very bottom of the worst two spots in the driveway. Then I went to the hardware and got two 50lb bags of “play sand” (the beige-colored, relatively coarse kind). When I went home, I parked in the street while I filled the two worst ruts as best as I could. Then I put the cardboard back down, on top of the place where I had sunk last night. It still feels more like gelatin than solid ground in more places than I care to admit. In spite of that, I was able to get the car in the driveway in such a way that I think I will probably get out OK tomorrow. This sort of drama is better than many other kinds. I mean, I have a house with a driveway. I have a paid-off, 11-year-old car that works pretty well and looks much newer than it is. This morning I was able to get out of that drive without outside help, and figure out a plan to make it better. The repair materials were not expensive and I had the resources to purchase and transport them. I am healthy enough and strong enough to carry the bags full of sand/gravel and do the work of fixing the problem. I enjoy “rescuing myself,” and this one took $20 or so and not a whole hour total. This is enough to bring a smile. It’s supposed to freeze tonight. In this case, it would be a good thing. I think I’ll reward myself by making some tapioca pudding. For me, that is comfort food. Catch you later!